See in Glossary that is playing the animation. 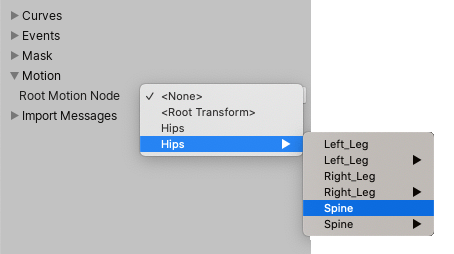 Sometimes however it may be necessary to manually select a different specific node within the hierarchy of your animation file to act as the root motion node. See in Glossary objects, as well as its root bone name, and a submenu for each item that has child objects. Each submenu also contains the child object(s) itself, and further sub-menus if / those / objects have child objects.